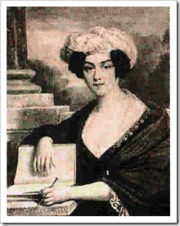 Do not confuse or combine with her mother-in-law, Louise-Henriette-Charlotte, née de Noailles (1754-1832), the other duchesse de Duras, a lady-in-waiting to Queen Marie Antoinette. Claire de Duras, née de Coëtnempren de Kersaint, fled France for Martinique after her father, the comte de Kersaint, a naval officer and politician, was executed in 1793 during the French Revolution. She then went to the USA, Switzerland, and finally to London, where in 1797 she met and married Amedée Bretagne Malo de Durfort, 6th duc de Duras. The couple returned to France in 1808. In Paris, Claire de Duras created a highly acclaimed literary salon that included many former exiles, and renewed her friendship with François-René de Chateaubriand, who encouraged her writing career. Ourika, published anonymously in 1823, was one of five novels Claire de Duras had written during the previous year; only two of them were published during her lifetime. Claire de Duras is currently considered a "single author." If one or more works are by a distinct, homonymous authors, go ahead and split the author. Claire de Duras is composed of 8 names. You can examine and separate out names.